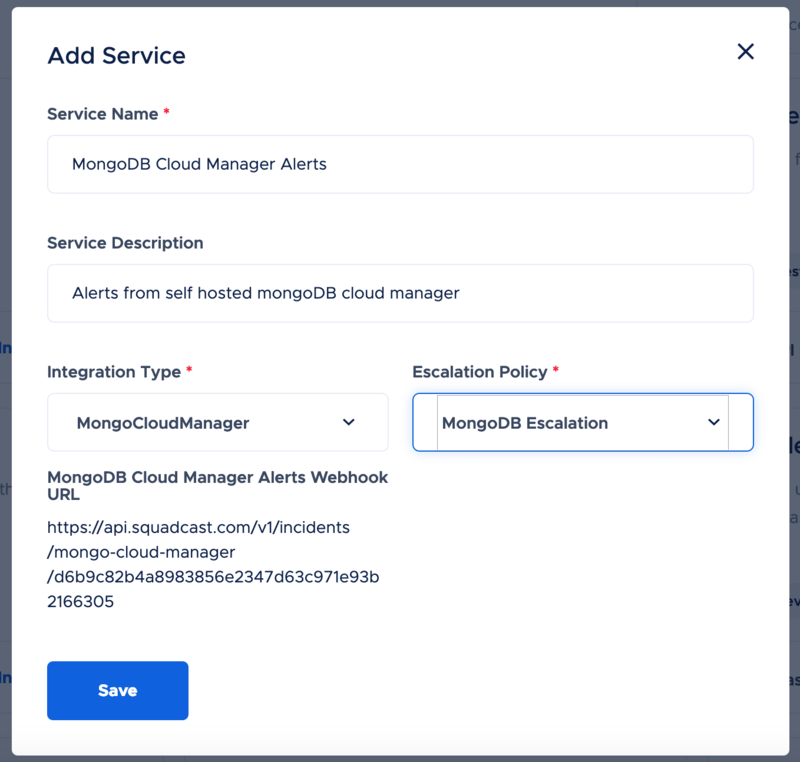 Follow the below steps to configure routing of your MongoDB Atlas / Cloud manager alerts to Squadcast. Note: MongoDB Atlas is the cloud hosted version of MongoDB offered by the company, whereas MongoDB Cloud Manager is the open source self-hosted version of MongoDB. 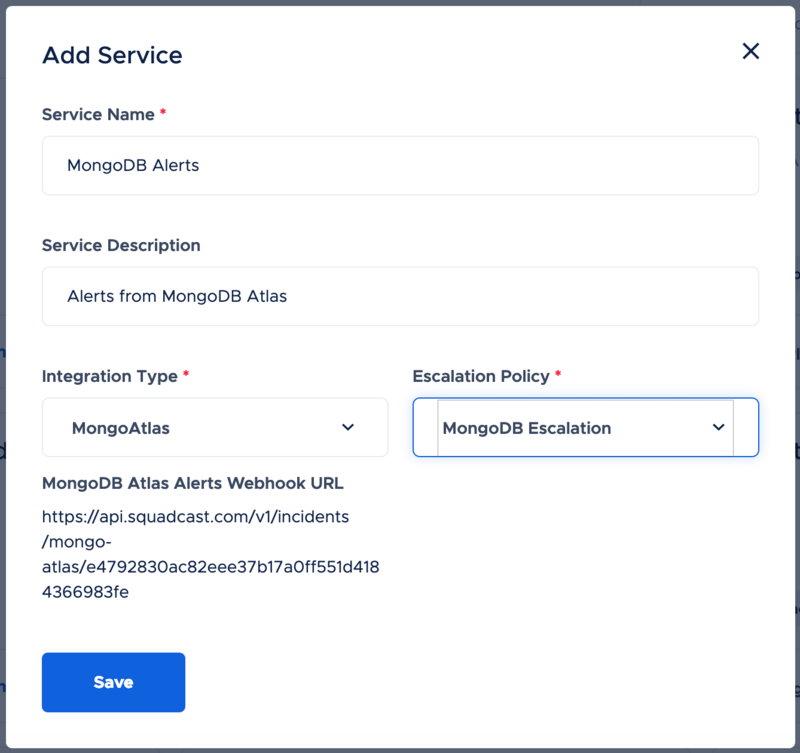 On the Sidebar, click on Services and click the Add Service button and enter the details such as Name, description, escalation policy and select the Integration type as MongoAtlas (For MongoDB Atlas hosted version) / MongoCloudManager (For Self hosted version) and click Save button. 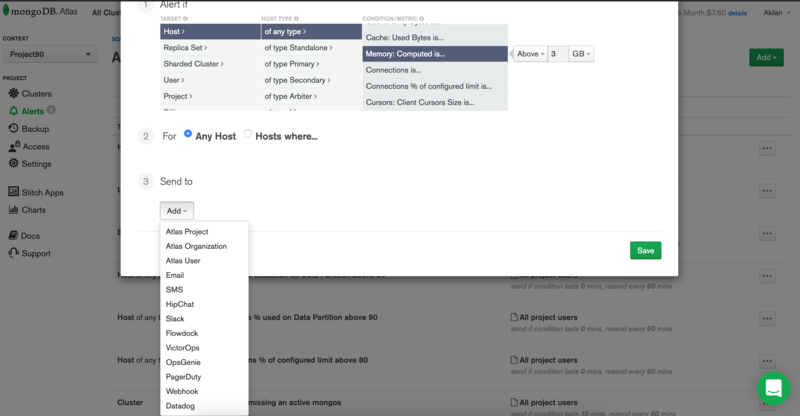 Make sure you copy the MongoDB Atlas / Cloud Manager Alerts Webhook URL before you save. 3. Now we can add the created webhook as an alert mechanism for both new / existing alerts. Click Add -> New Alert to create a new alert. 4. 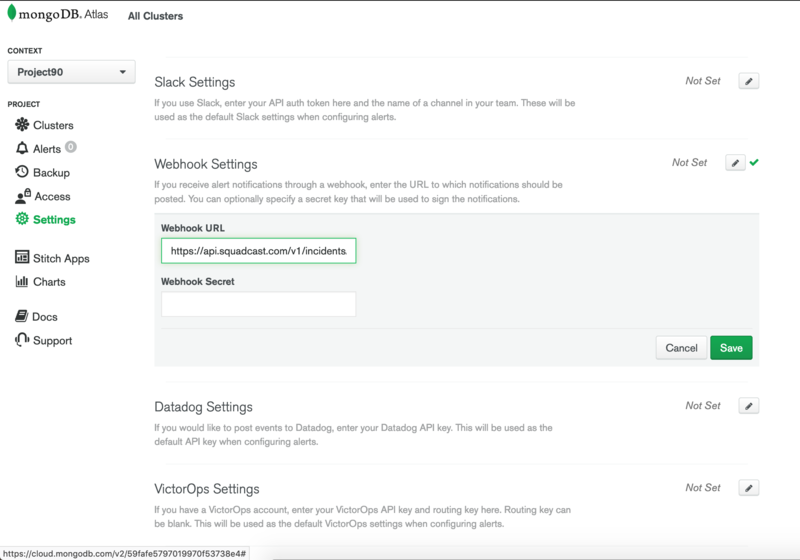 Define the alert parameters and under Send to, select Webhook and click Save button. 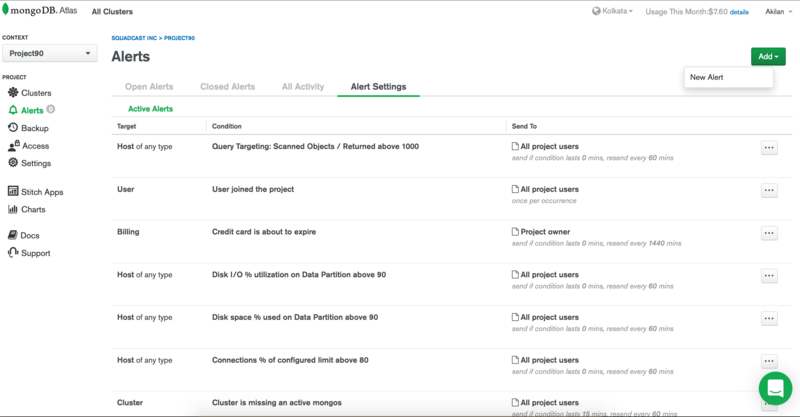 The Alert is configured and integrated with Squadcast and whenever it is triggered in MongoDB, an incident will be triggered in Squadcast as well. 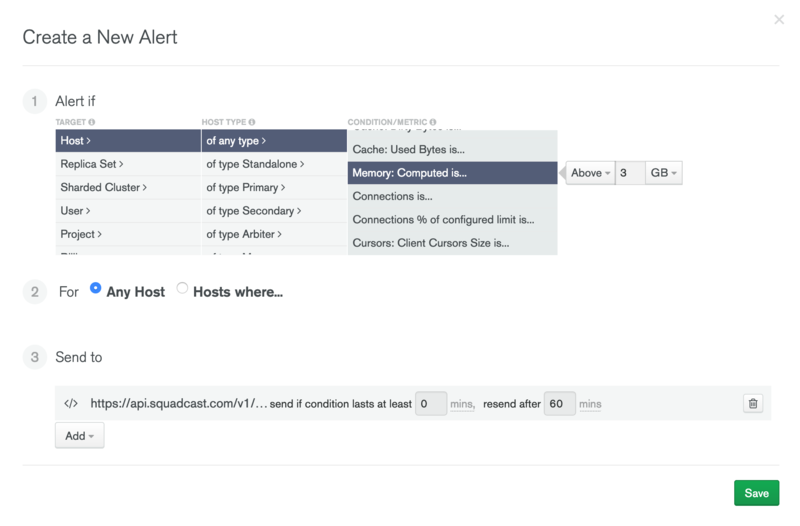 Squadcast automatically syncs the alert status from MongoDB as defined below. If a user Acknowledges the alert in MongoDB, Squadcast will also Acknowledges (Auto-Acknowledge) the incident in Squadcast, provided the same user (with same email ID) is also present in Squadcast. Squadcast will Auto-Resolve the incident, if the alerts get resolved in MongoDB and doesn't require any manual intervention from the user.